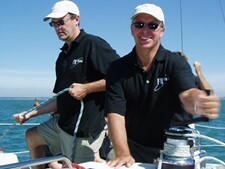 Whether you are looking to take your clients or friends out for a day on the water, sailing is a great way to do this. The presence of a professional Skipper onboard allows you and your guests the opportunity to participate safely, with no prior knowledge necessary. Established in 2003, our expertise is in Corporate Sailing, regularly organising team days and mini regattas designed to encourage team work and improve performance with dedicated skippers on hand to meet your requirements and maximise your enjoyment. Any one of our yachts is well suited for a Corporate Sailing day and can be chartered individually, or matched up with others for team events. We are happy to discuss all the various charter options available to you and give you an honest opinion on how we can best meet your requirements. Itineraries are available on request. Regular clients include Aon, Chubb Insurance, Allianz, FM Global, ICB Group, Arthur J. Gallagher, Cosan Consulting, JLT, Euler and Atradius. Please sign up below if you would like to receive our news and updates. We will never pass on your Email Address and you can Unsubscribe at any time. Our Privacy Notice explains how we handle personal data.